If you're any self-respecting music fan, there was probably a point in time where you wanted to make music yourself. And then you realized you didn't have any talent. And then you realized you couldn't afford the instruments. The Guitar Collection: George Harrison won't solve your talent or instrument problem but at least it'll let you see the instruments of a supremely talented musician. It's an app about George Harrison's guitars. The quiet Beatle (and lead guitarist) obviously built up an impressive guitar collection during his career and held a personal collection to all of 'em. Seeing one of his guitars is like seeing an extension of him. 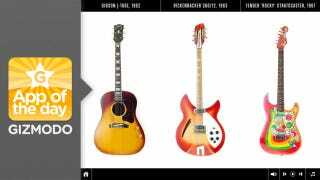 The app gives full 360-degree views of seven of Harrison's guitar collection including the Stratocaster "Rocky," the Rosewood Telecaster, and the Rickenbacker 12-String. More pointedly, the app also explains the history of the guitar and how Harrison came to like each with pictures and details galore. It's not just about the guitars. Well, fine it totally is. But it's more about how much these instruments meant to the great artist himself. You'll hear audio clips of Harrison talking about the guitars, be able to listen to a music library while you navigate the app and even see videos of various celebrities (Ben Harper, Conan O'Brien, etc.) playing Harrison's guitars. It's like a library of instruments for your iPad. The app is deeply revealing (and interesting) for anyone who's curious to see the relationship a musician has with his gear. Fascinating and fantastic. Like a nerd's personal preference on his gadgets but oh so much cooler.